As there's a very important referendum coming up in our country next week we decided to have a look at voting and having a say in what happens around us. 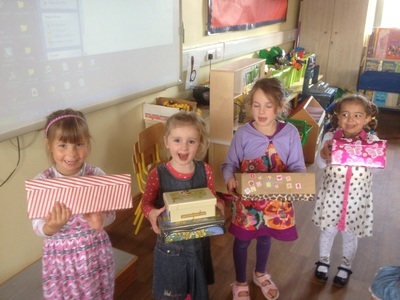 Eleanor (James' mammy) who helps out lots in our classroom had a great idea to make a ballot box and some voting cards. We picked two stories ( "Fidgety Fish" and "Hurry Up Birthday") and decided we would hold an election to see which book we would read for storytime. Each person got one vote and we talked about keeping our vote secret if we wished to. 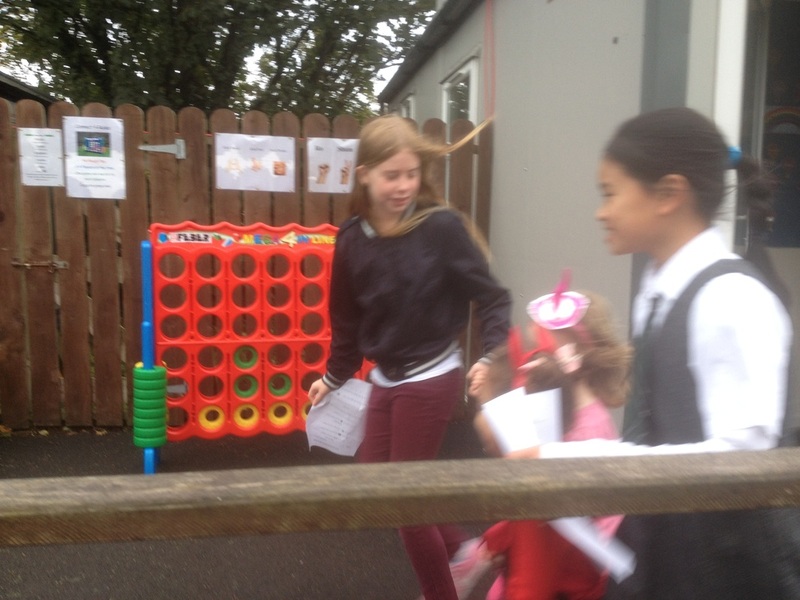 Our polling station was in our pretend train station ( this week's Aistear theme). Usually polling stations are in schools. Everyone cast their votes and it was great as there was never too long a queue!. While Eleanor was manning the polling booth Fionnuala took predictions on which book some voters thought might win. Early exit polls pointed towards "Hurry Up Birthday" coming out on top. We would have to wait for the count though. ﻿The count centre was set up on the Bord Buí (yellow table) and once the ballot box was opened Timmy worked hard at sorting the votes into two piles. 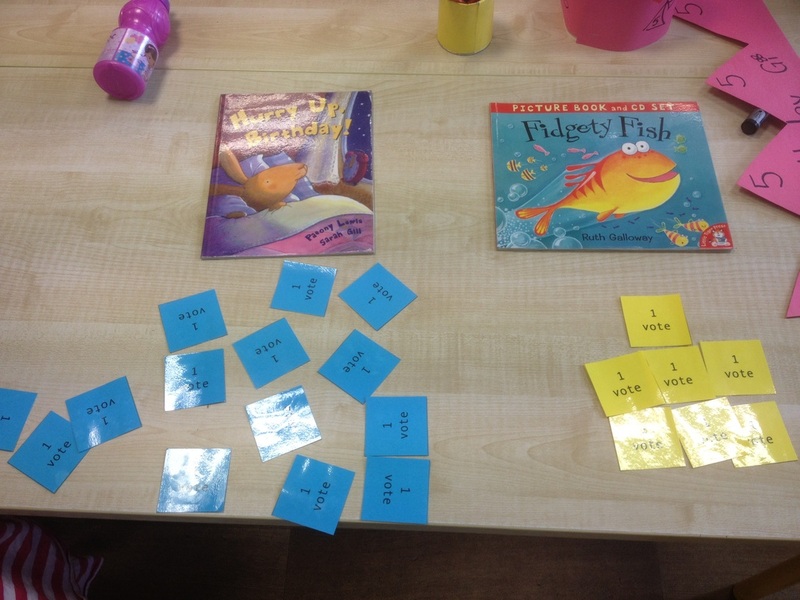 Nikola counted the yellow votes ( 7 for Fidgety Fish) and Lily counted the blue votes ( 14 for Hurry Up Birthday). Daniel was an observer and seems interested in politics!. We had a winner!. "Hurry Up Birthday" it was to be. Even though everyone didn't get their choice of story we saw how important it was for everyone to have their say in the decision. 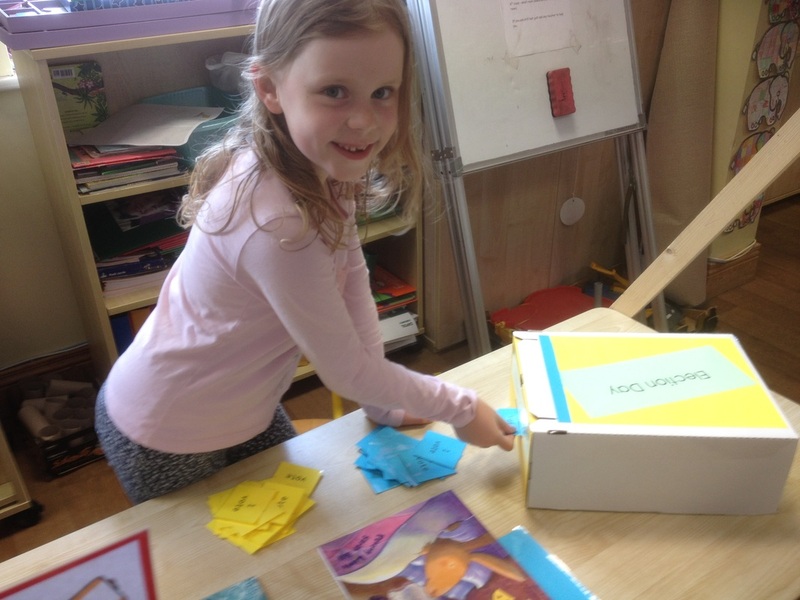 Thank you to Eleanor for making the ballot box and votes and for helping us to have such a fun way to learn about voting. 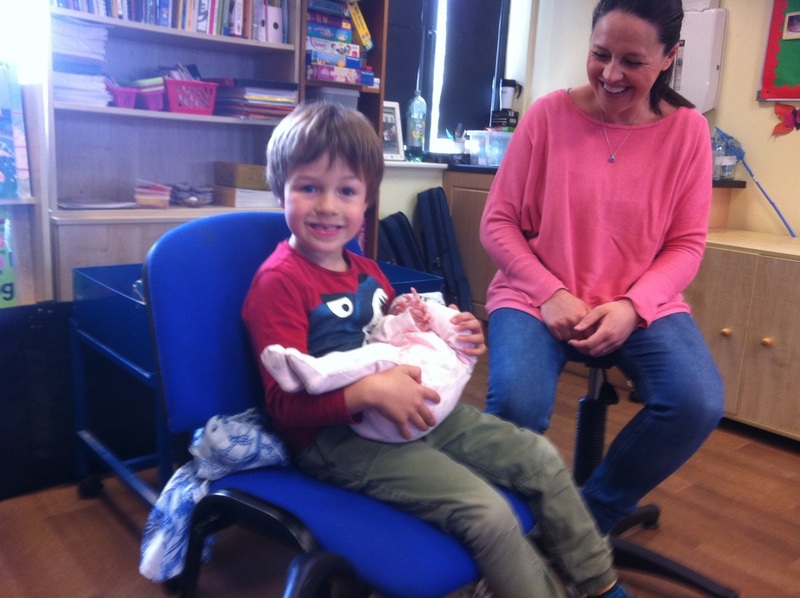 Leon's mammy, Lisa came to school with his baby sister, Billie. Billie is only five weeks old and she's gorgeous!. 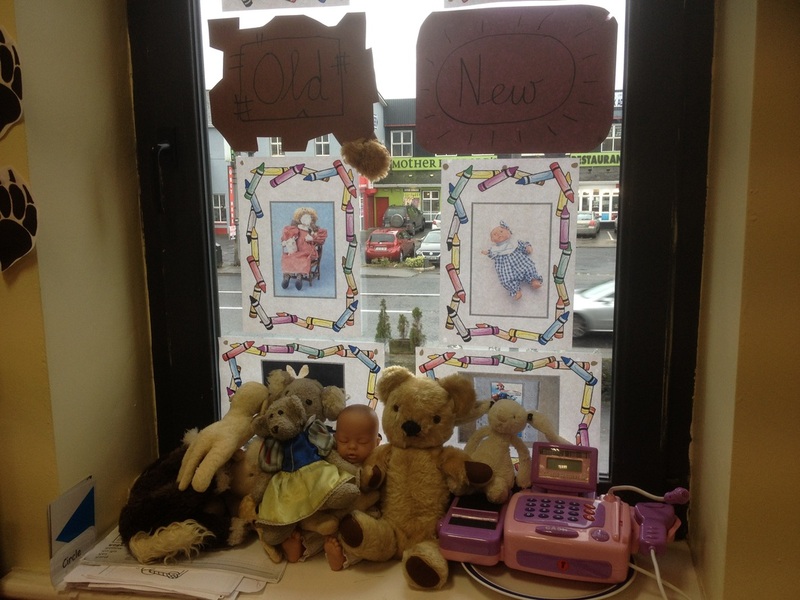 Lisa and Leon told us all about what a baby needs and how to take care of Billie. Leon is really good at calming her if she cries and at getting her to sleep. Lisa showed us what she had in her changing bag and explained what each item was for. A baby needs to have lots of things with them!. Thanks for the visit Lisa and well done Leon for being such a good helper. 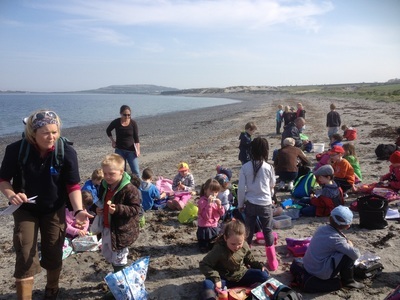 We've been making the best of the fabulous weather and today, 23rd April we joined up with Senior Infants and headed off to the beach at Bishop's Quarter. We wanted to have a fun outing but we also wanted to explore and learn about the seashore. Rúairí's Mammy, Vera works for the Marine Institute and they kindly allowed Vera to join us today as our expert and we were very happy to have her along as her preparation and expertise made our day. 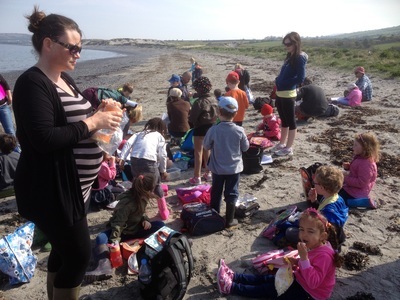 When we got to the beach we had a snack to get our energy levels up for the 'work' ahead. After break Vera showed us how to make little piles of rocks at the edge of the water so we could check back later to see if the tide had come in or gone out while we were exploring the beach. Then it was off to comb the beach for marine litter. Anything on the beach which shouldn't be there could harm sea creatures and marine life. Sometimes this litter is left by careless people or sometimes it's washed up on the beach. We collected lots of this litter and we hope that by removing it from the beach we've played our part in taking care of the marine environment. 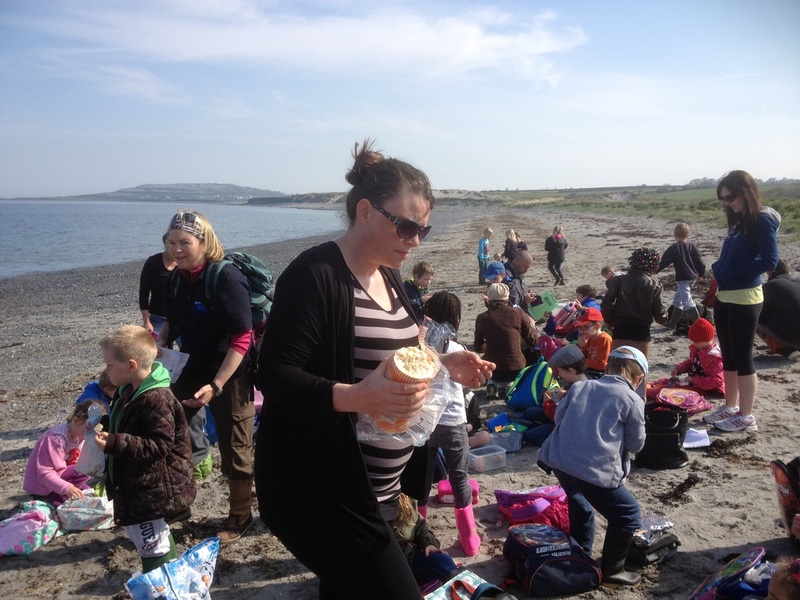 Alan ( Seán's daddy) gathered up all the marine litter we found and took it up the beach so we could take it to the cars as we were leaving the beach....thanks Alan!. 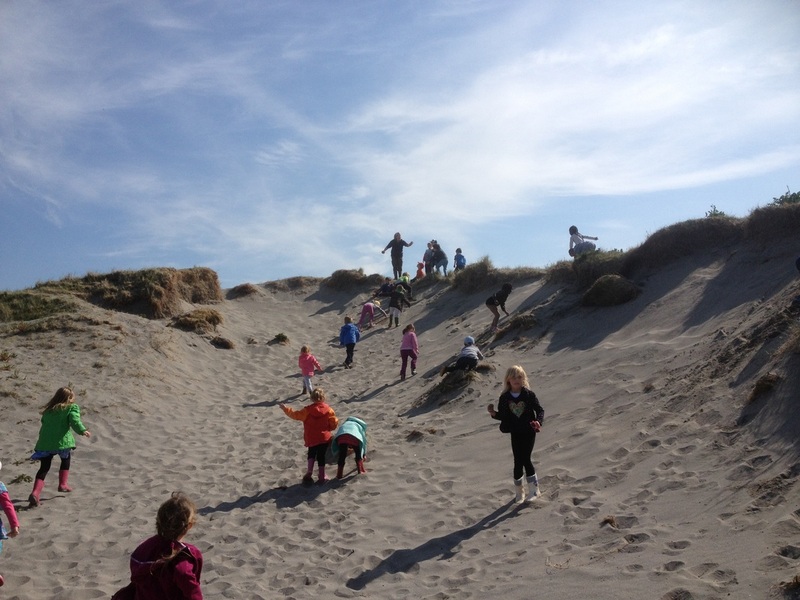 Next it was off to the sand dunes where Vera explained how they were formed. 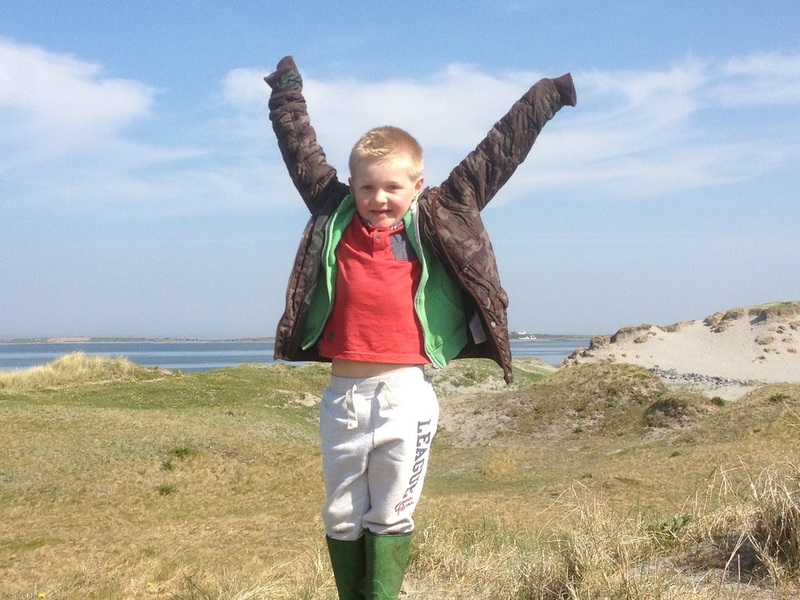 We had time to run up and roll down the dune lots of times and it was great fun!! After the sand dunes it was back to the seashore to check our piles of stones. We saw that the tide had gone out quite a bit from when we had first arrived at the beach. Now it was on to the rock pools where we had great fun looking for seaweed, limpets, periwinkles, crabs and anything else we could find. Vera had put down lines before we arrived at the beach and she had caught a crab which she showed us and which some of us ( if we wanted to!!) could hold. Of course we returned the crab to the water when we had had a good look at him. 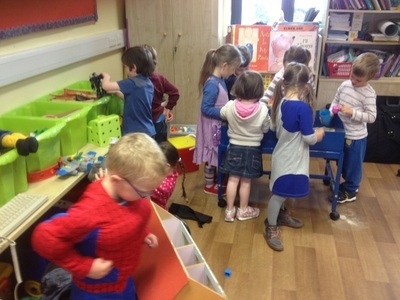 We had a super turn out of parent helpers from both classes. 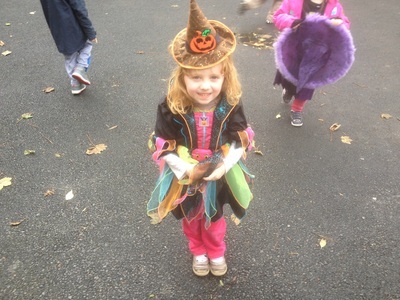 In Junior Infants we had Anna ( Lily's mammy), Karima ( Mael's mammy), Alan (Seán's daddy), Vanessa (Molly's mammy), Blanka and Osama (Nikola's parents) and Fergus (Jasmine's daddy). Daniel's daddy, Bertrand was also along on the trip, helping out with Tracey's class. Regina from school also came along to provide valuable support. 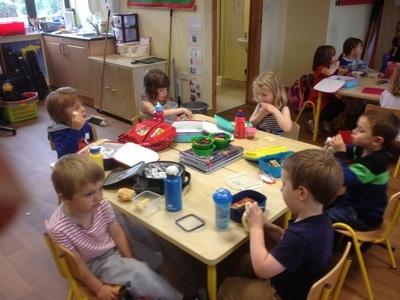 A huge thank you to all of these helpers as having so many willing helpers not only ensured the children's safety but it also allowed the children to ask lots of questions and to have extra time from an adult to guide their learning experience. A huge thank you to Vera who gave us so much time this week between her preparatory visit to both classes on Monday and her presence on our trip today. Her expertise and passion for all things marine were invaluable to us. Thank you also to the Marine Institute and their Infomar department for releasing Vera to facilitate such important learning. Thanks to all the children in Junior and Senior Infants who as usual made us very proud with their fantastic behaviour and good humour. Last but by no means least thank you to our Board of Management who funded our bus today. They will be delighted to know that the trip was such a success. 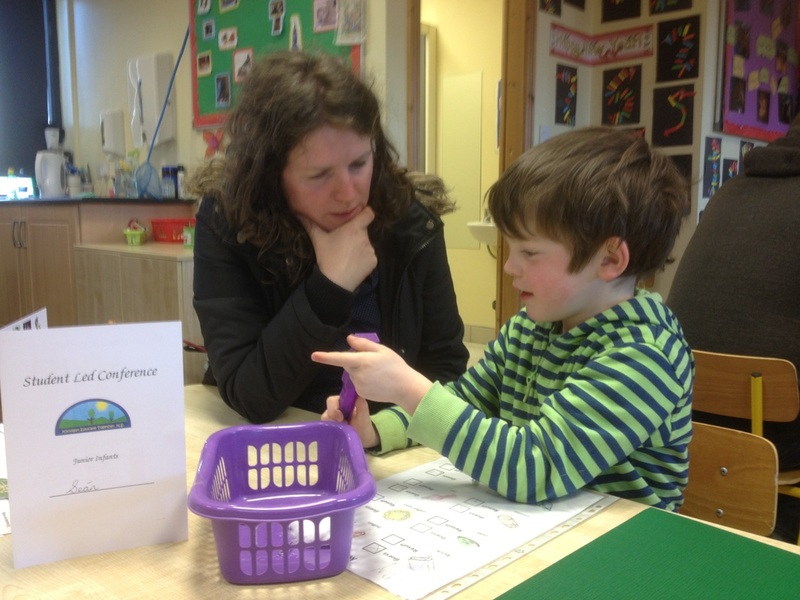 Student Led conferences have been taking place in our school all week. 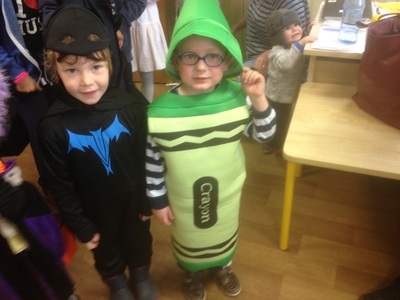 It was our turn in Junior Infants on Tuesday. Our families visited our classroom and we showed them, and told them all about our work. We were the presenters and we did an amazing job. 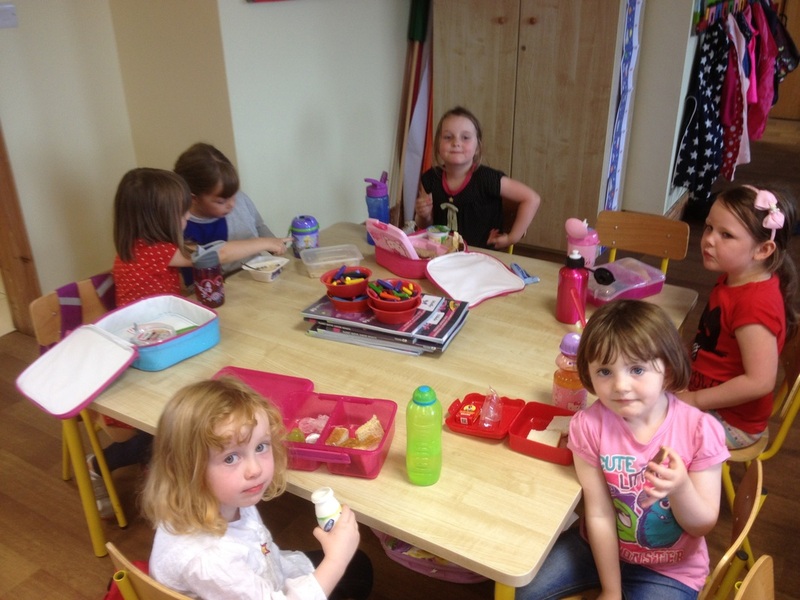 Fionnuala was very proud of how confident, competent and knowledgeable we were. Our families also seemed very happy and proud of us. It was a super day. We've been looking at Wangari Mathaai as a person who made a difference in our world. Wangari was born in Kenya and she became very concerned about the level of deforestation taking place in her country. She and some of her friends/followers peacefully protested about the damage cutting down so many trees was causing and when she didn't appear to be getting anywhere she decided to start to replant trees to counteract this damage. Wangari set up an organisation called The Green Belt Movement which works towards planting huge numbers of trees. We also spoke about a story which Wangari told called 'I Will Be A Hummingbird' (available on youtube). This story encourages everyone to follow her thinking on doing your best. " I will do what I can". Wangari won the Nobel prize for her fantastic committment and work towards protecting our environment. In science we've been looking at floating and sinking. We guessed first if the items in our basket would float or sink in our tubs of water and we then tested to see if our guesses were accurate or not. Not all things which are big sink and not all things which are small float so it got us on to looking at the effect of air in an item influencing if an item will sink or float. Chinese New Year started on Thursday 19th February and runs for 15 days with the Lantern Festival celebrated on the last night. 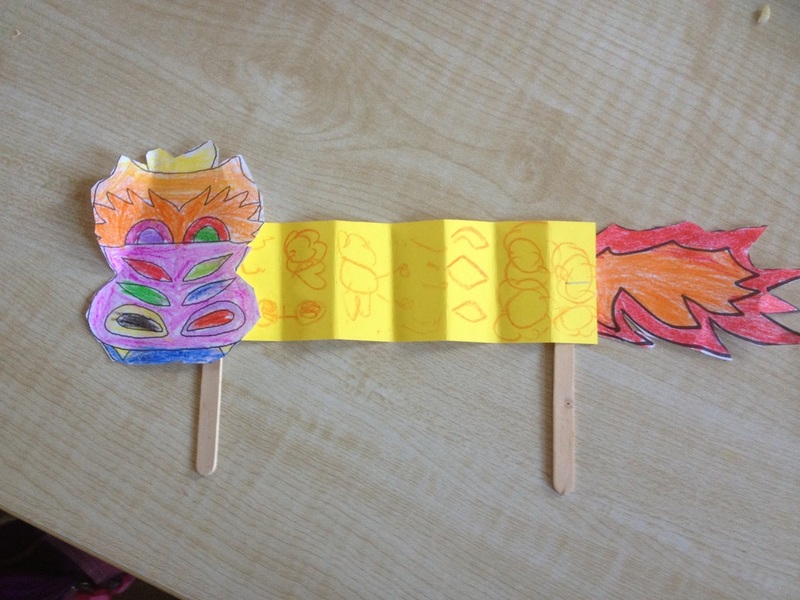 We've been learning lots about how Chinese people celebrate their new year. They give their houses a good clear out and sweep away bad luck. 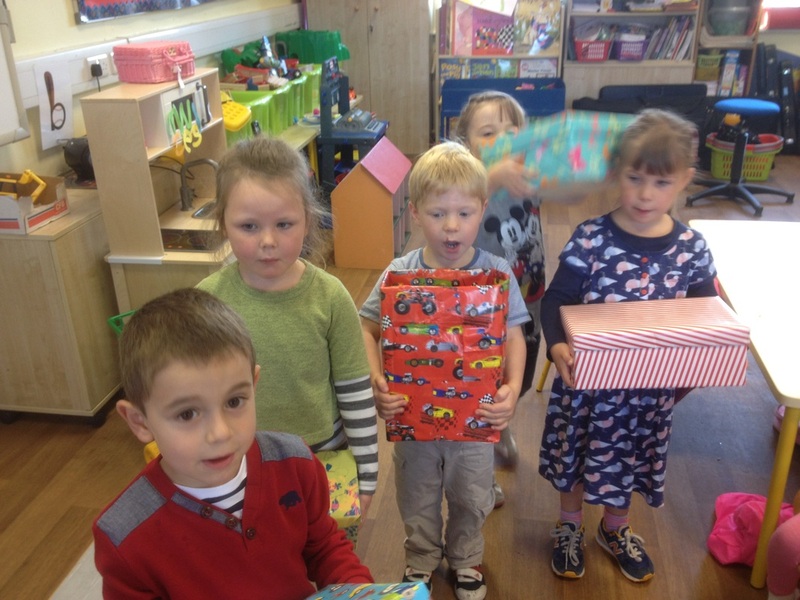 Children receive presents of little red envelopes of money. People dress up in new clothes and they decorate their houses and streets for the festival with lots of pretty lanterns all around. They make huge dragons and lions and do dragon and lion dances together. They have big parades where they show off these dragons and lions. 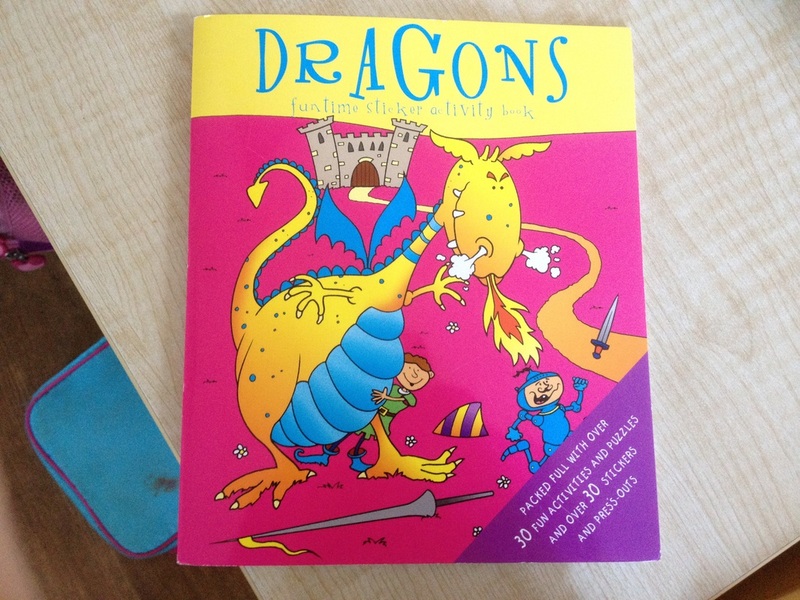 We read some dragon stories. 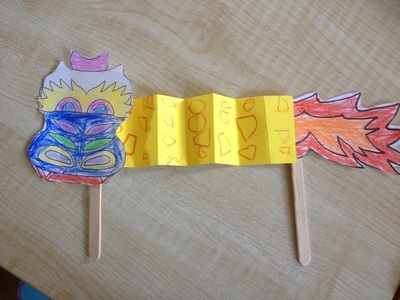 Anna McCarthy was in our classroom for a day and she helped us make some lovely, colourful, cut and stick dragons. Chinese people use chopsticks to eat with. We tried them out. It was easier to pick up mandarin orange segments than sultanas!!. 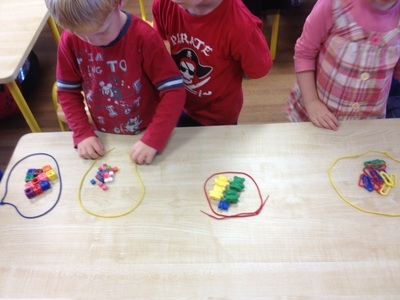 We're looking at ordering number in maths at the moment. 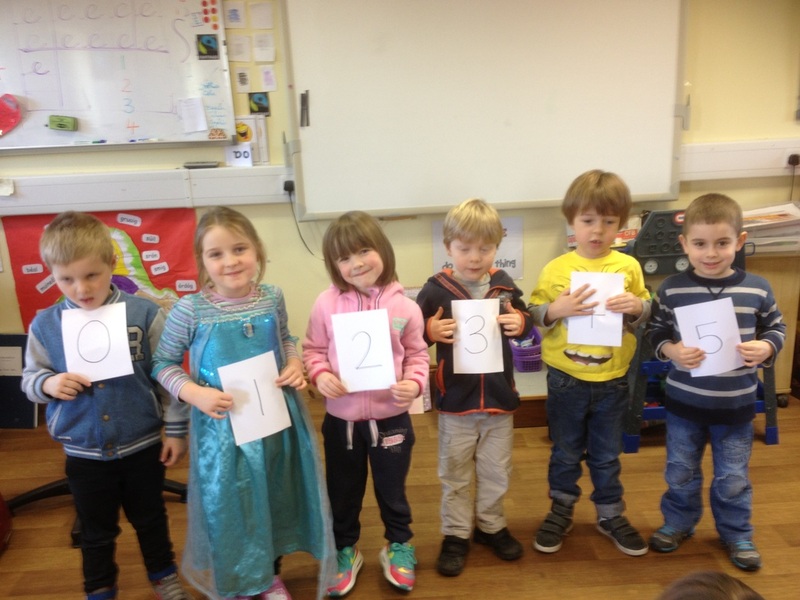 We jumbled up our numbers and then we got an 'unjumbler' ( yes we made up that word!!) to move people so that the numbers were in the right order. Valentine's Day gave us a great chance to practice our cutting skills which have improved hugely in the past few months. 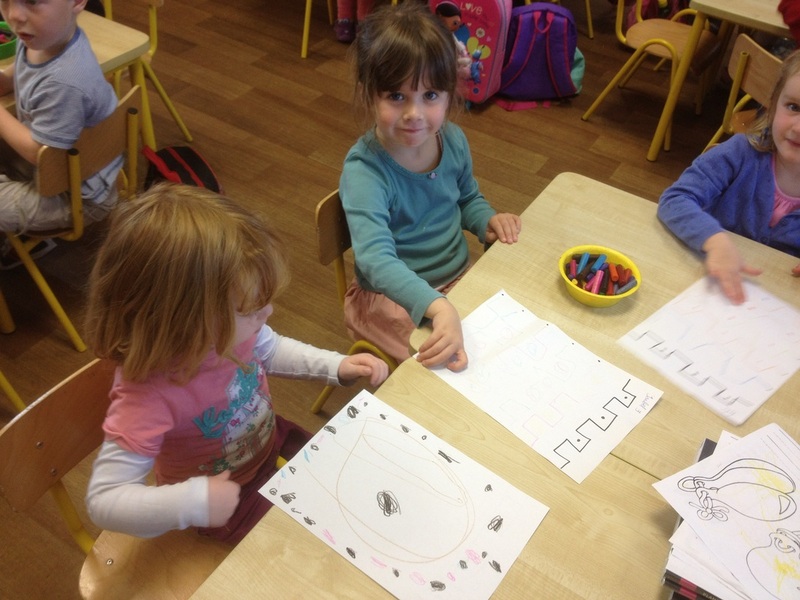 Fionnuala and Pauline helped us to write the words as we're still learning how to write letters. We'll be joining these letters soon though!. 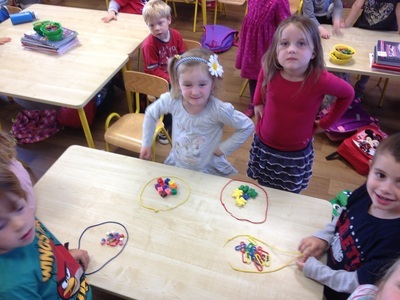 We then decorated our hearts....we love glitter!!. Our friends from 3rd class came in to read to us. We picked cool stories from our library and we went into groups to listen to them. 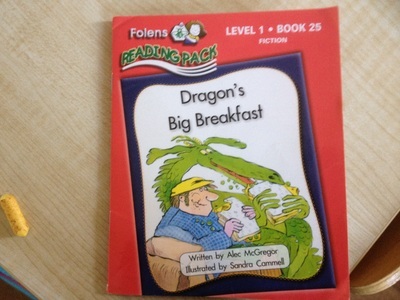 3rd class are super readers and they did a great job of reading, explaining and asking us questions. 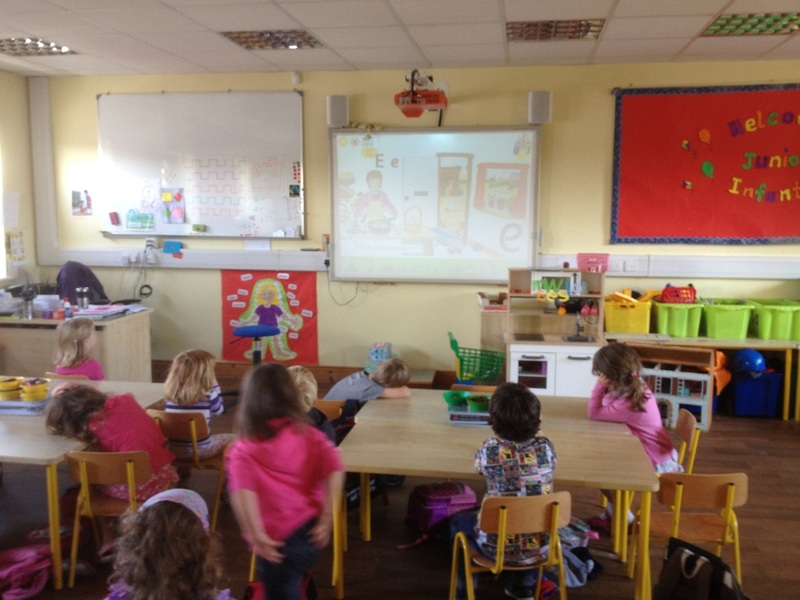 We've been looking at how to ask questions recently and so we were well ready to ask 3rd class some questions too. Next time they come to read to us we're going to read to them too. We're looking forward to it as it was a very enjoyable time. 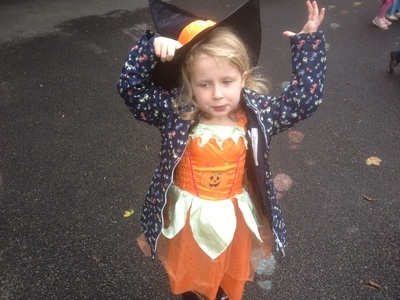 Thanks to Clare for sharing her class with us!. 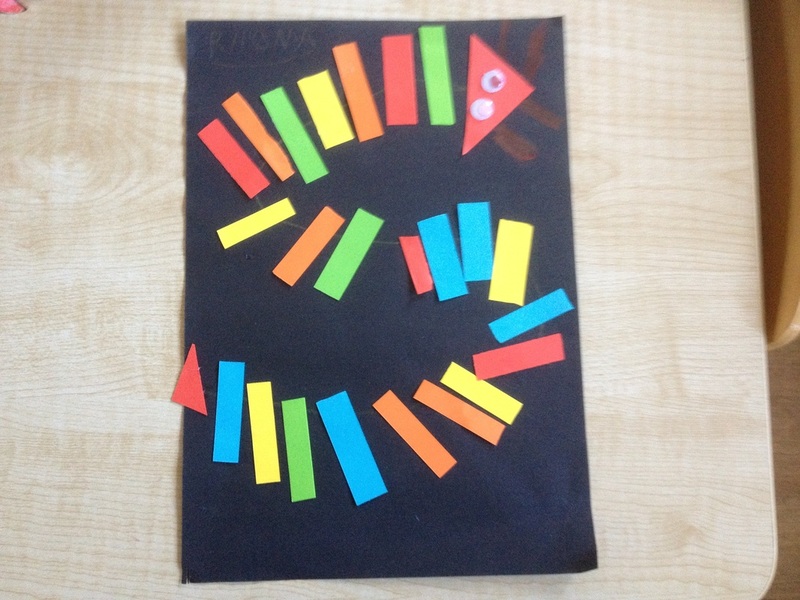 Lily made a whale...whose mouth could open and close. 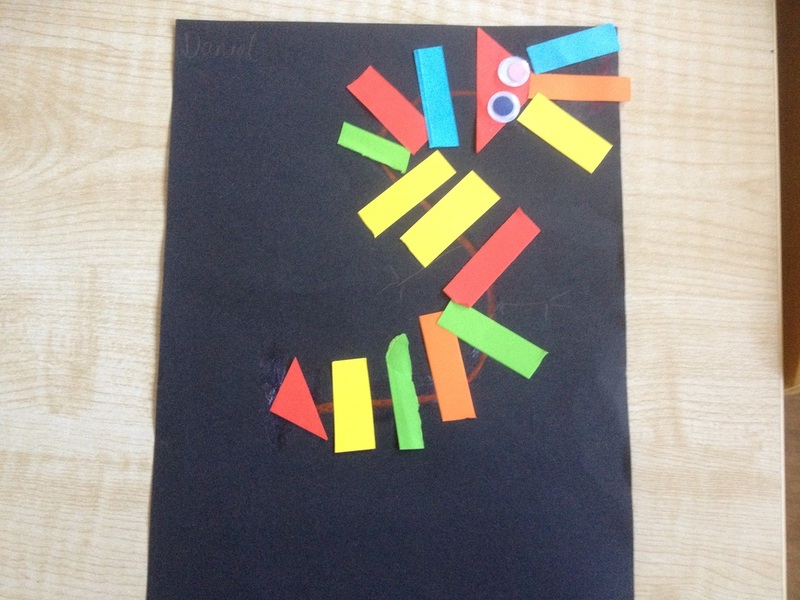 Seán made a really interesting machine and he explained to us all how it worked. Izzy made Elsa from Frozen and did a great job of explaining how she made her. In Science we've been looking at magnets. We went around our classroom and checked out what was and wasn't attracted to our magnets. We then played a game on our interactive whiteboard where we had to put lots of items into two groups 'magnetic' and 'non-magnetic'. We also worked as scientists by first guessing if an item was attracted to a magnet or not and we then tested it to see if our guess was correct. Our lovely bulbs which we planted in Autumn with Caragh's daddy, Rory have popped up above the soil. We were very excited to see the shoots. We planted 3 different types of bulbs and we're looking forward to seeing which ones come out first. As we're looking at people who make/made a difference to our world we've been talking about Peter McVerry and his ongoing work with homeless people. We all feel that it's not fair for some people not to have a home to live in and feel safe in. We talked about Peter's fundraising efforts and his efforts to encourage the government to tackle the issue of homelessness. This linked into us talking about what a government is. Isabelle's mammy Maeve came to visit us to tell us all about her job. Maeve works as a nurse in the hospital. She works with little babies and children. She wears a lovely pink uniform with lots of pictures on it so that children feel more at ease when they visit hospital. 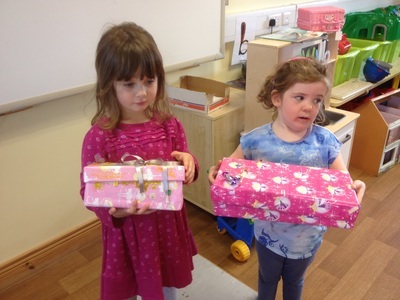 Isabelle was her mammy's helper during Maeve's visit and she was excellent at helping out. Maeve brought a baby doll with her so she could show us how she helps little babies who are sick or who need an injection to stop them from getting sick. She puts some 'magic cream' on the baby's arm before an injection is given to numb the arm so an injection doesn't hurt too much. Maeve brought a book with lots of pictures of our bodies, inside and out. We had a chance to ask her lots of questions and she was very knowledgeable and patient with us all!. We knew the names of lots of the instruments that Maeve uses in her work as we have just finished our doctor's surgery theme in our Aistear programme. Maeve gives the children she works with a sticker after she sees them. She kindly brought stickers for all of us too. Thanks Maeve for taking the time out to come and talk to us. 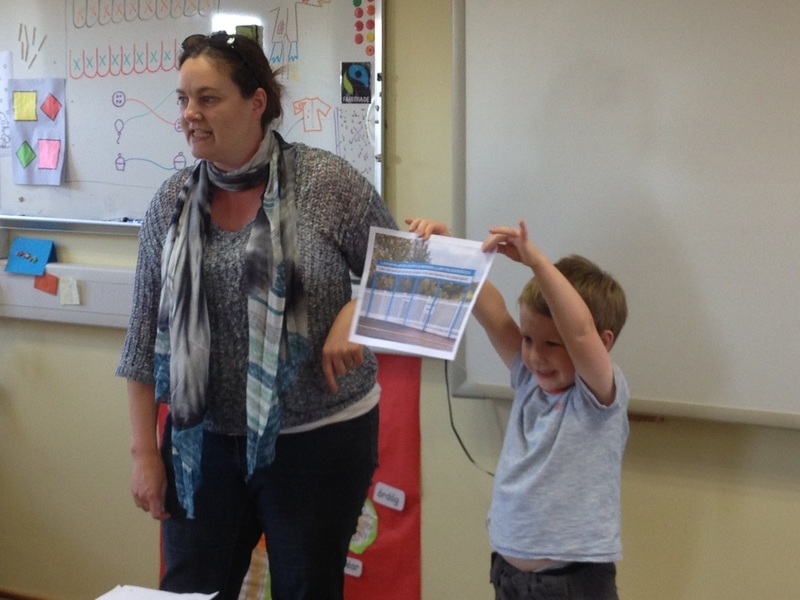 Alex's mammy, Helen came to school today, 16th December to tell us all about earthquakes, volcanoes and how mountains were formed. She brought lots of props and explained everything really well to us. Alex was a fantastic assistant. Helen got us to hold hands and make a big circle and we then sent a wave around the circle to show how an earthquake happens. We knocked the buildings Helen had made from building blocks. One building stayed standing...it was earthquake proof! 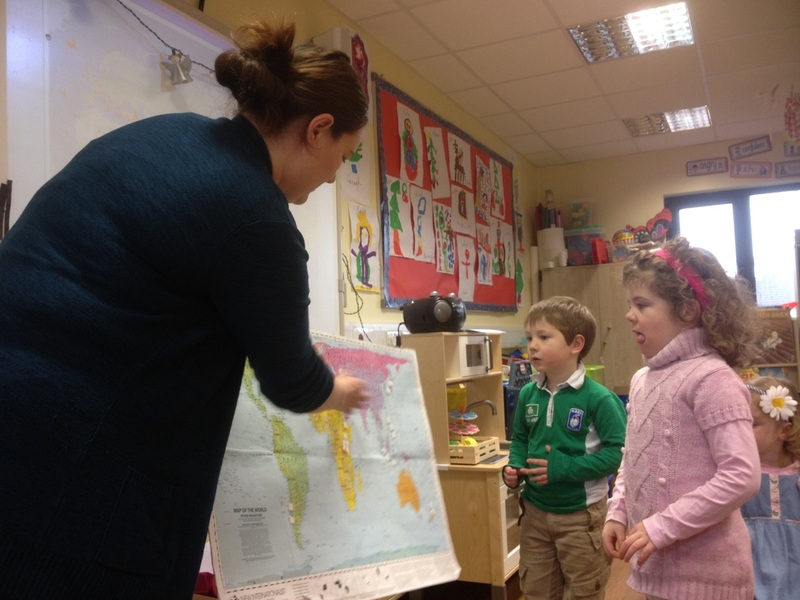 Helen gave us a little picture of a volcano each and we took turns to stick them on a map of the world where volcanoes are to be found. Helen's favourite volcano is Mount Saint Helens which is found in southwestern Washington. 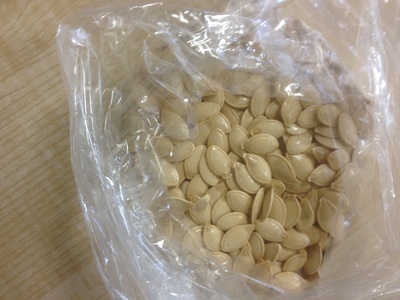 Next it was time for an experiment. 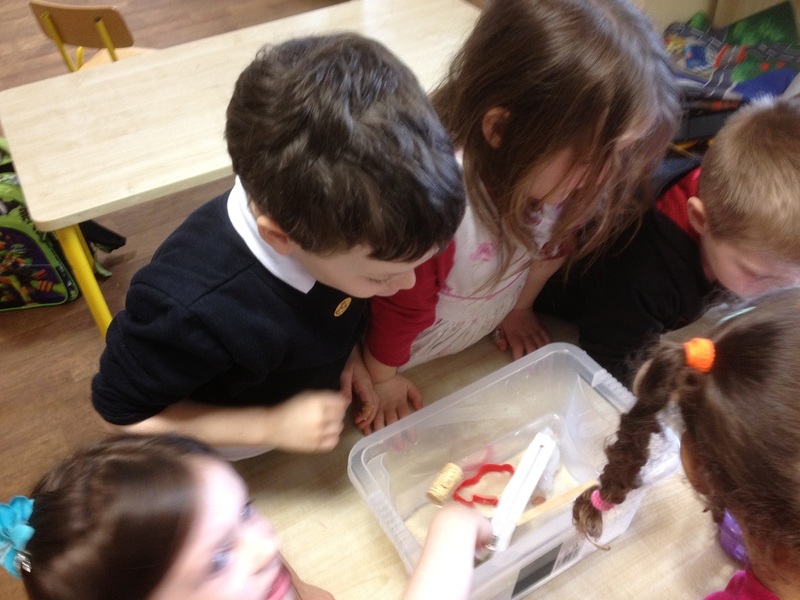 Helen and Alex had made a really cool volcano at home and they showed us how mixing vinegar and baking soda made the volcano erupt. There was lava everywhere!!!. We all had a chance to make a volcano of our own at the end of Helen's lesson. She brought everything we needed with her and we had them made in no time!. Thanks Helen for a very interesting hour. We really enjoyed your visit. In Learn Together over the next few months we're going to look at some people who have made or continue to make a big difference in our world. Where better to start than with Malala Yousafzai?. We talked about Malala and her wish for all children, girls as well as boys, to have an equal chance of a good standard of education in a peaceful setting. We're really glad she won the Nobel Peace Prize and we're going to help to spread her message. As part of the Belief Systems strand of our Learn Together curriculum we're learning about and celebrating Hanukkah at the moment. It started today the 16th December and will continue for eight days. Here's Otis with his mammy's menorah which she kindly loaned us. 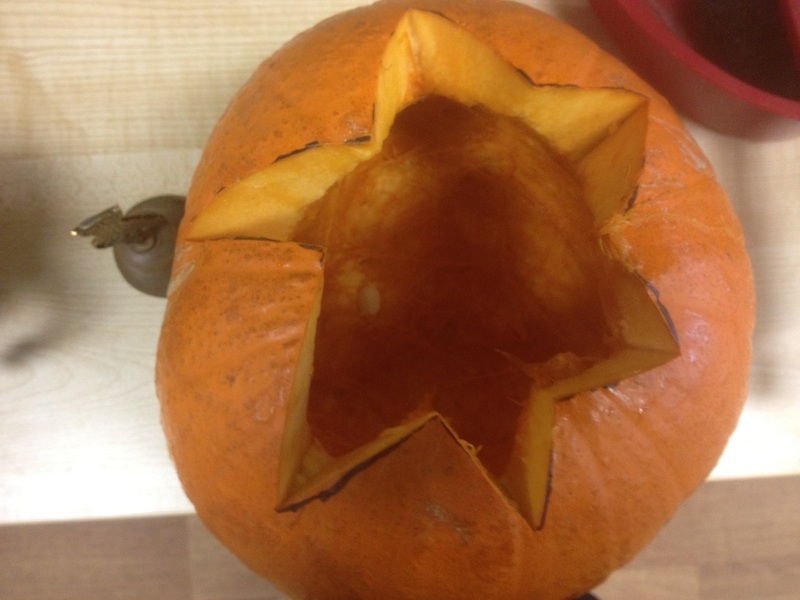 Otis' mammy taught us a Hanukkah song earlier in the term and we sang it on our CD. We sang it again today. Avital sang the song with us on our CD. Thanks Avital. Mael's mammy Karima came to our class for the day to help us prepare for our Winter Show. Eleanor who is James' mammy ( in Senior infants) has been helping us a lot in our class lately and she's really good at drawing so she drew a big robin for us. 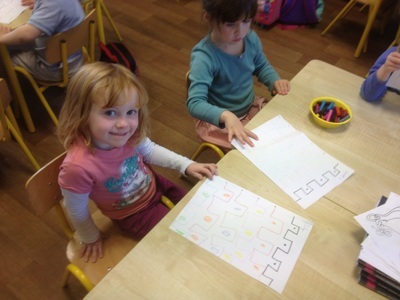 Eleanor and Karima then helped us to 'colour in' our robin with little pieces of fabric which Irina very kindly gave us. It was a lovely picture for the Winter art show in Kilcornan on Friday 12th December. Thanks to everyone on the Parents association who organised the show. They did a super job and we really enjoyed the evening. We painted snowmen for the show too. And we also made some friendly penguins from milk cartons...it's always good to recycle!. Here are our penguins at the show. 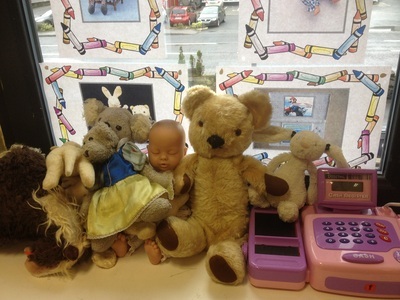 As part of our Aistear programme ( framework for learning through play) we're looking at the doctor's surgery this month and Jasmine's mammy Lydia came to visit our classroom today to tell us all about her job as a nurse. We showed her our doctor's/nurse's kit and she explained what each instrument was for. We all had a chance to ask Lydia questions and to tell her the connections we were making between what she was saying and our experiences. 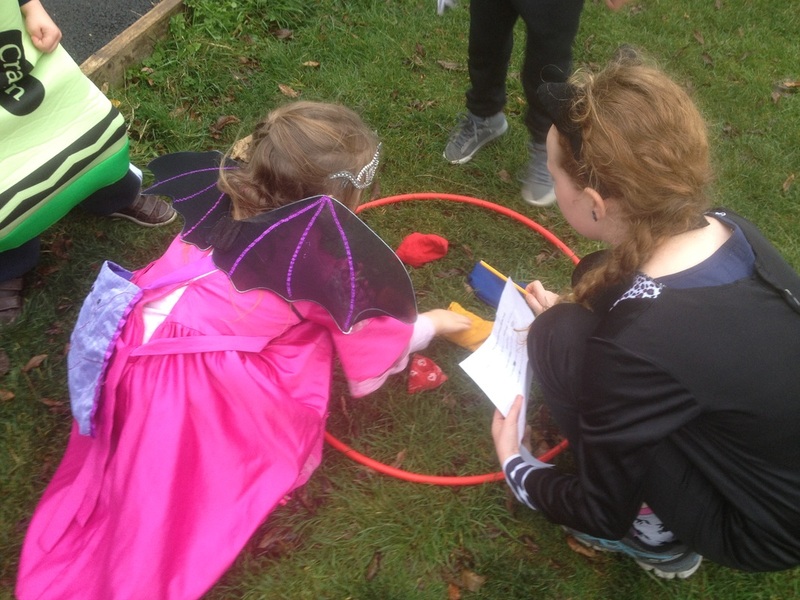 During Aistear time we have five different activities on the go each month so we get a chance to work on each of the activities once during the week. This month we are working on our doctor's surgery where we have a waiting area, a reception desk and a consultation room where our patients get to discuss their symptoms with the doctors and nurses. 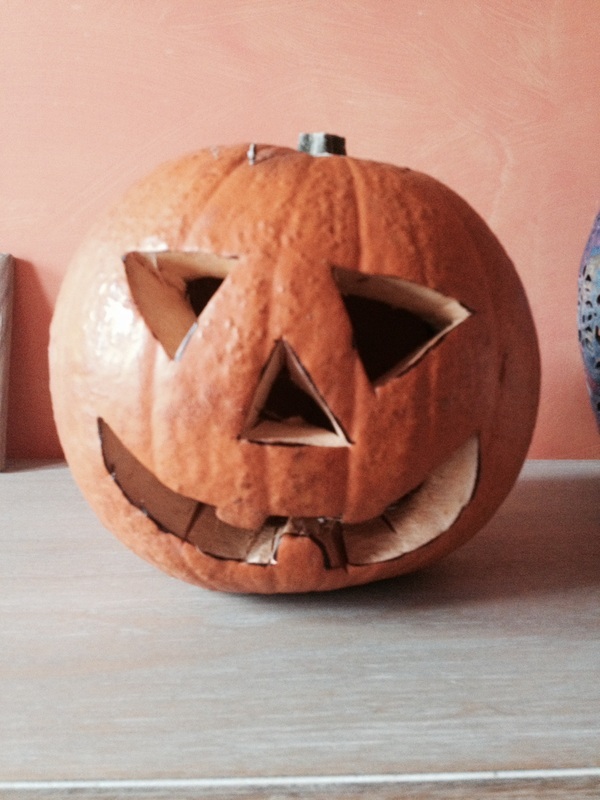 We have already had quite a range of symptoms and illnesses in our surgery!. Molly getting organised in the reception area. There's a lot to do between answering the phone, keeping track of appointments and asking patients to fill out their patient details! (This is a great opportunity for the children to work on their free writing skills). Molly was very polite on the phone and kept the surgery running smoothly!. Dearbhla being seen by Dr. Jasmine who used her stethoscope to diagnose the problem. 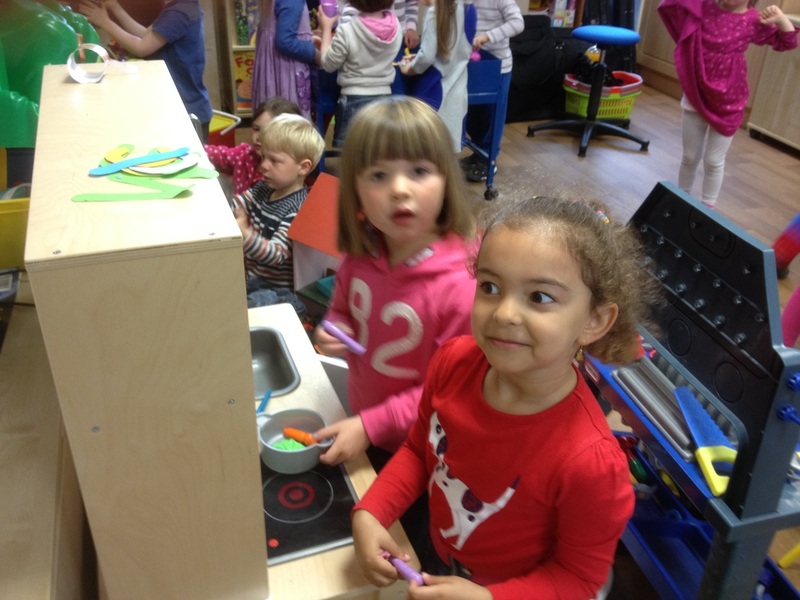 Three other stations we're enjoying this month are magnetic construction, playdough and a garage in our 'Small World' area. Here are some photos of these activities. We added a new station this month called 'Junk Art' where we are using recyclables to make fabulous new creations. This is great because we're a green school but it also helps with our manipulation skills and our creativity. What will we make today?. Look at Otis' super creation. Isabel was being crafty and creative!. 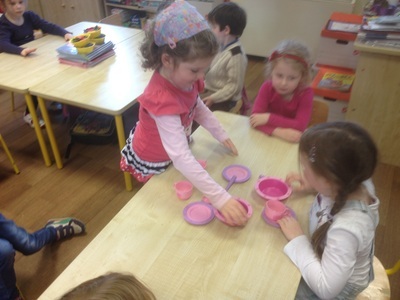 Izzy's dad Dave came to visit us in Junior Infants today ( 20th Nov) and he brought two brains with him. 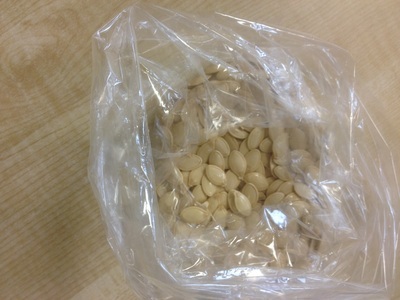 No, not real ones!!. Dave told us all about our brain and the many amazing jobs it carries out for us. Just as we are unique, so too are our brains. He showed us a model of our brain and he told us all the names of the different parts and what each part is responsible for e.g. our movement, our memory, our sight etc. He showed us how to make a cell from playdough and he showed us some cool slides and pictures. Junior Infants showed amazing listening and they knew lots of answers to Dave's questions. They also asked really clever questions and Dave encouraged us to keep asking questions as that is how we'll learn more. Dave has a stand at the NUIG Science Fair this Sunday 23rd Nov and you'll find him in the Aula Maxima in the university. He works in neuroscience and so it should be a super interesting stand. Thanks to Dave for giving us a fantastic preview and for sharing his time with us. What an interesting start we had to our day today!. Ruairí's daddy Peter came to visit us to help us look at the microscopes and magnifying glasses which we have on loan at the moment. Peter and Ruairí's mammy, Vera ordered the microscope kit from England so that everyone in our school can experience them. We had a great time using the magnifying glasses to look at lots of things around our classroom and we all got to try out the 8 microscopes in the kit. We viewed samples like sand, coins and even a wasp through the microscopes. Thanks to Peter for sharing his time and expertise with us. We really enjoyed his visit. In history and science we've been looking at old and new toys. 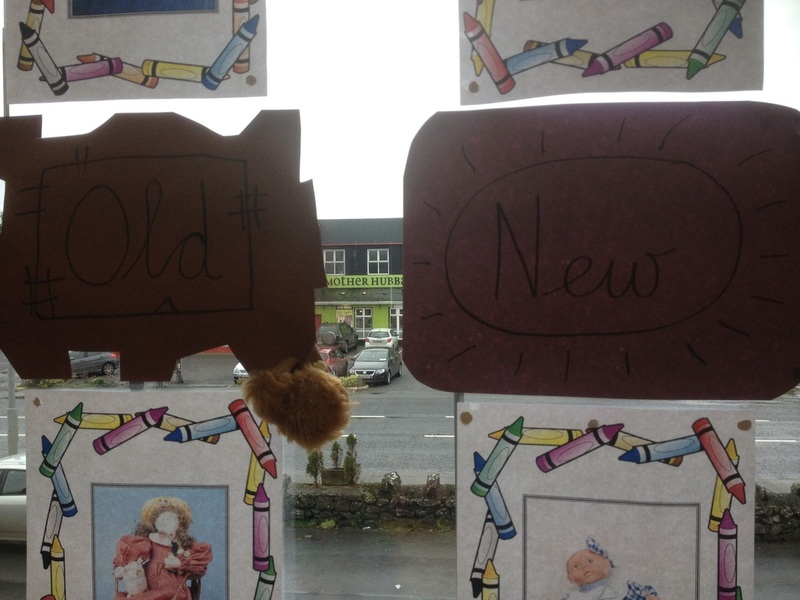 We looked at how toys have changed over the past hundred years and we compared old and new toys to see what characteristics they have e.g. flat fur v furry fur, worn v unworn etc. In science we looked at what materials toys used to be made of and what they're mostly made of now. 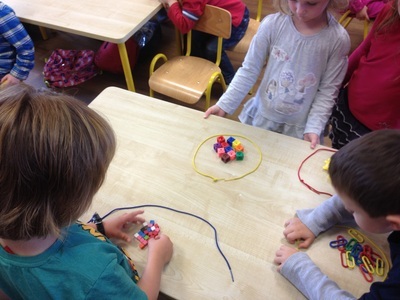 We discovered that a lot of toys were made of metal and wood in older times and toys are mostly made of plastic now. We are looking at one to one correspondence at the moment. 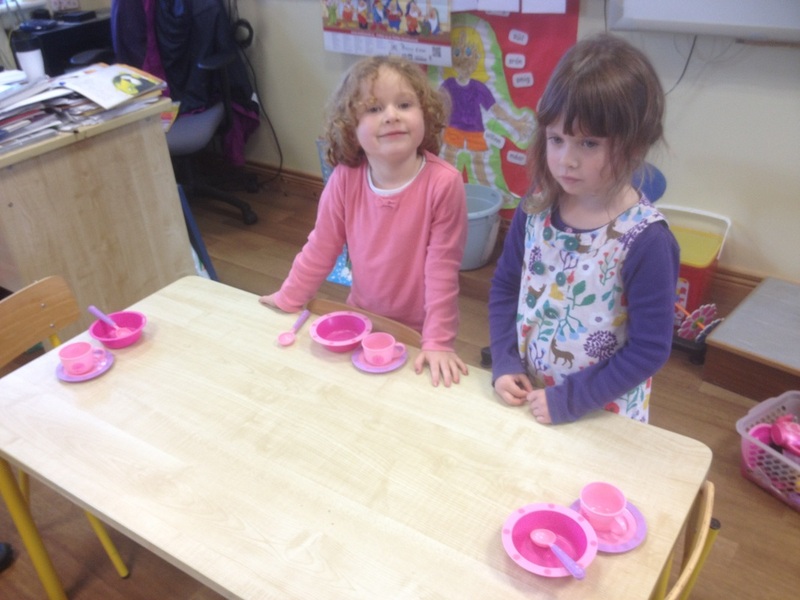 We invited our friends to breakfast and we made sure that each person got 1 bowl, 1 cup, 1 saucer and 1 spoon. 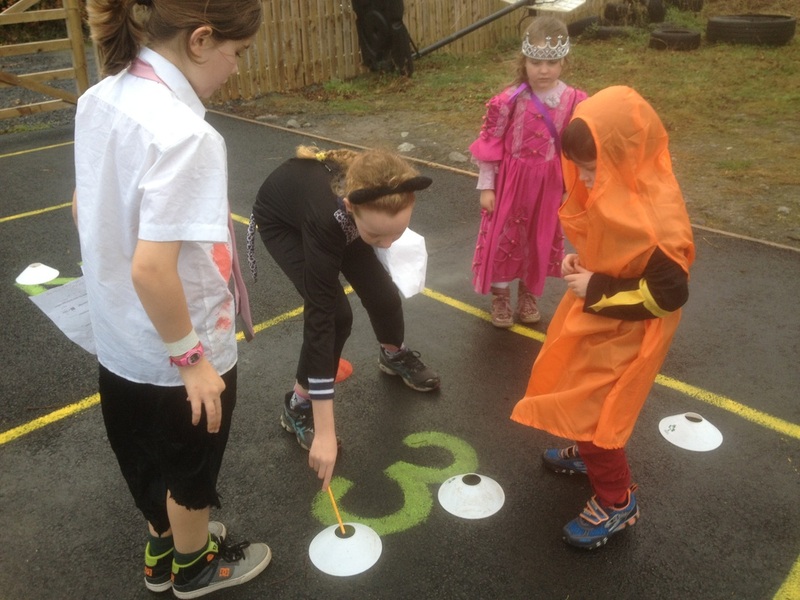 Tracey and Sorcha organised a maths trail for us and we teamed up with our friends in Declan's 5th class to complete the trail around the school. It was work and fun combined and we really enjoyed making sure we had covered all the questions. There's maths all around us!!. 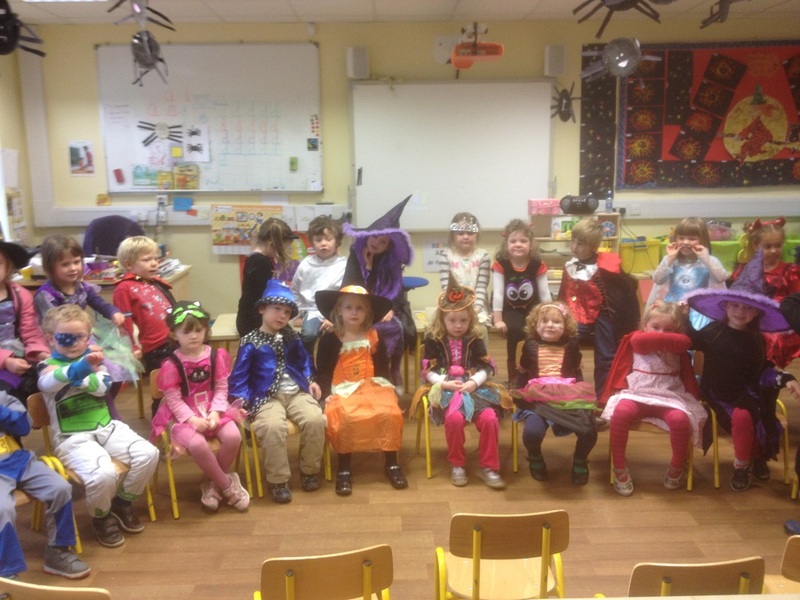 We invited our families to our Halloween concert in our classroom. We shared our Halloween poems and songs with them. 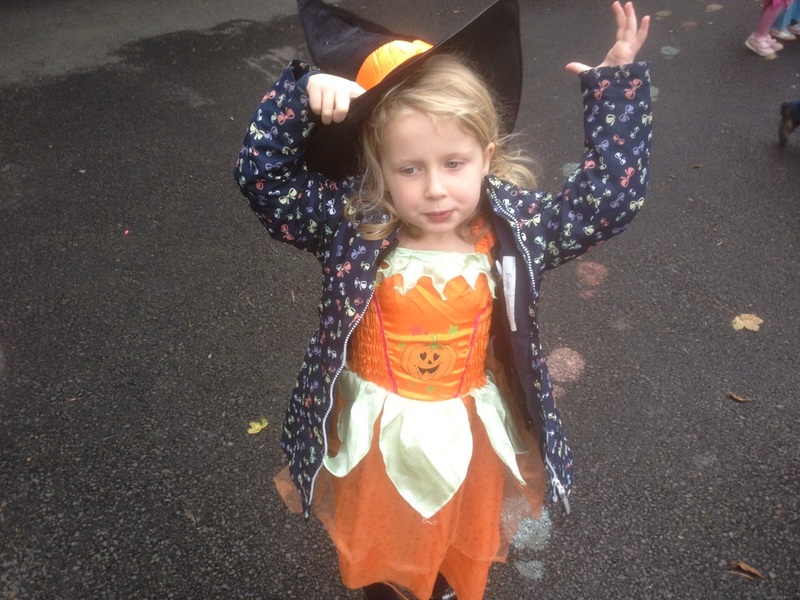 We were super and we were scary!!!. 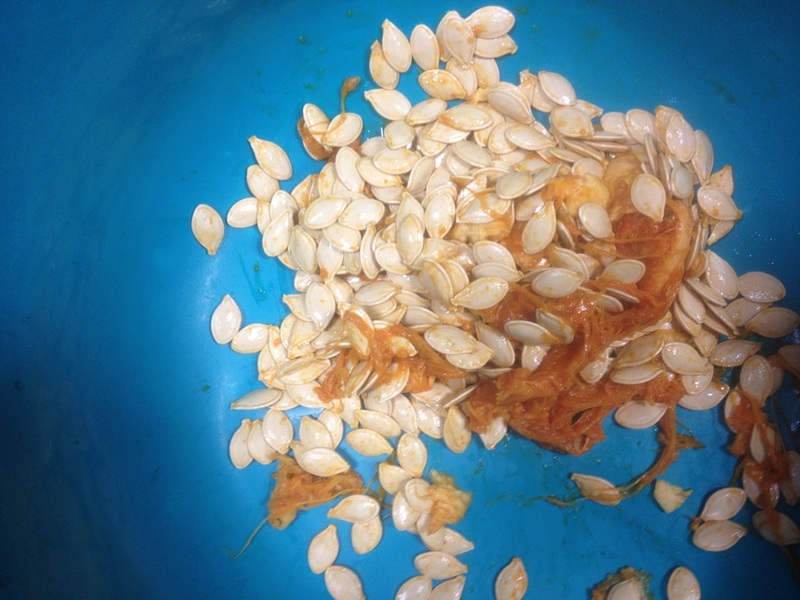 Anna put salt on half of our pumpkin seeds and Chinese five spices on the other half. We all got to try them and they were yummy!!!. 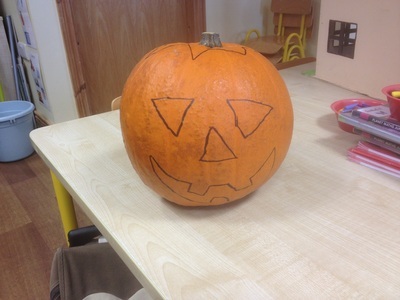 We went trick or treating in Kilcolgan Nursing Home. Our friends in 4th and 5th class walked with us and we met lots of new friends in the nursing home. 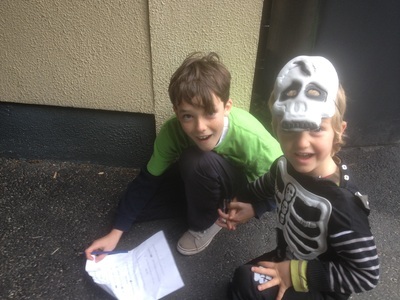 We sang our Halloween songs for them and 4th and 5th class played lovely music. Caragh's daddy Rory came to help us plant our bulbs. We planted some crocus, daffodils and snowdrops. They're all tucked up nice and warm beneath the soil now and we're looking forward to Springtime when they'll pop their heads up above the ground. Thanks Rory for all your help and advice. 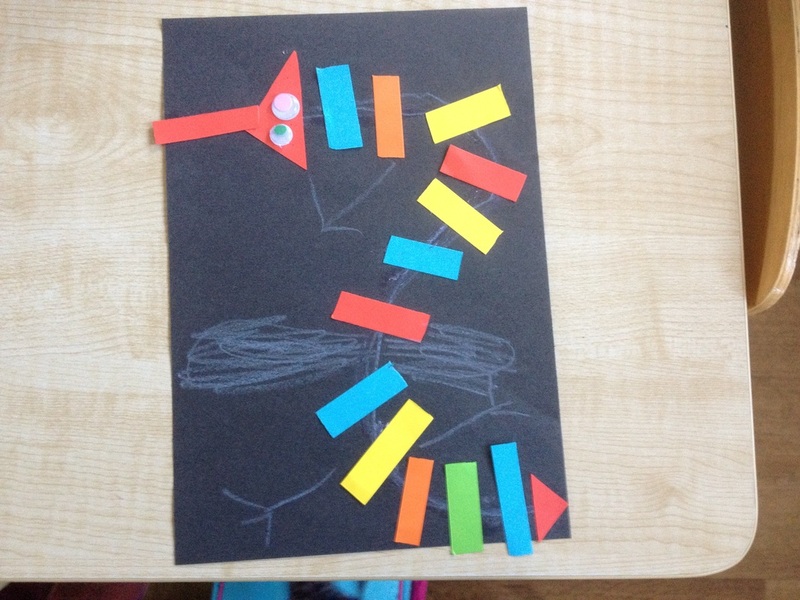 We looked at the story of The Little Red Hen. We talked about what happened first, what happened in the middle (next) and what happened at the end. 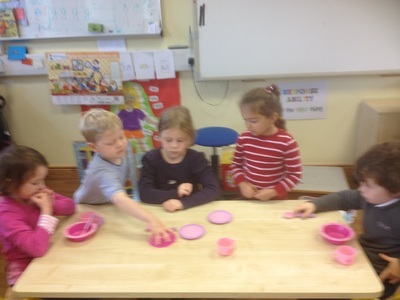 We made some butter by shaking a jar of cream and used it on our yummy scones. Some of us had butter and cream. 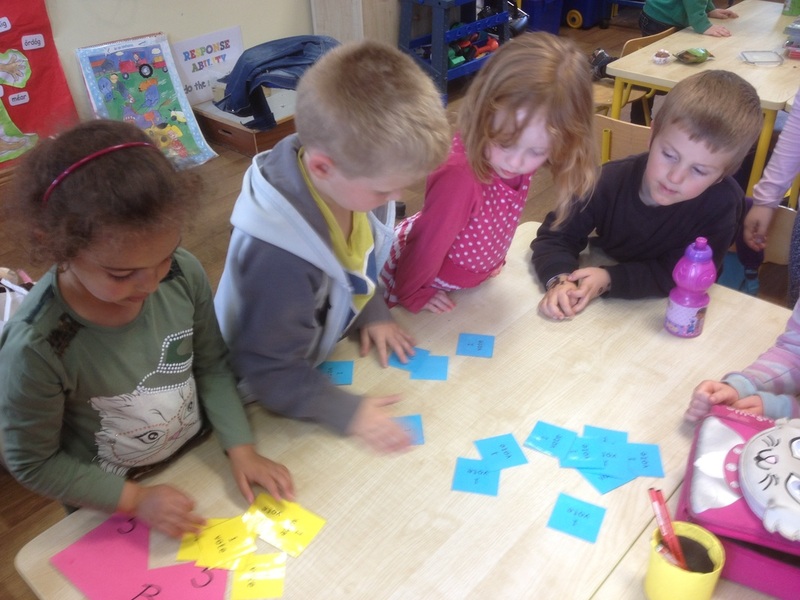 We've been sorting and classifying during maths time. 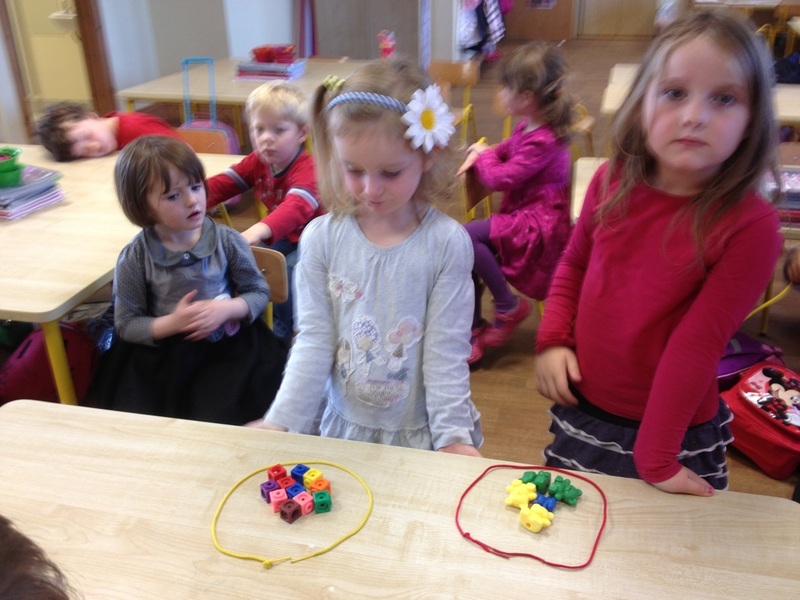 Fionnuala mixed up things from our maths equipment and we sorted them in teams of four. We put a string around our sorted groups to keep them separate and to make sure nothing escaped!. 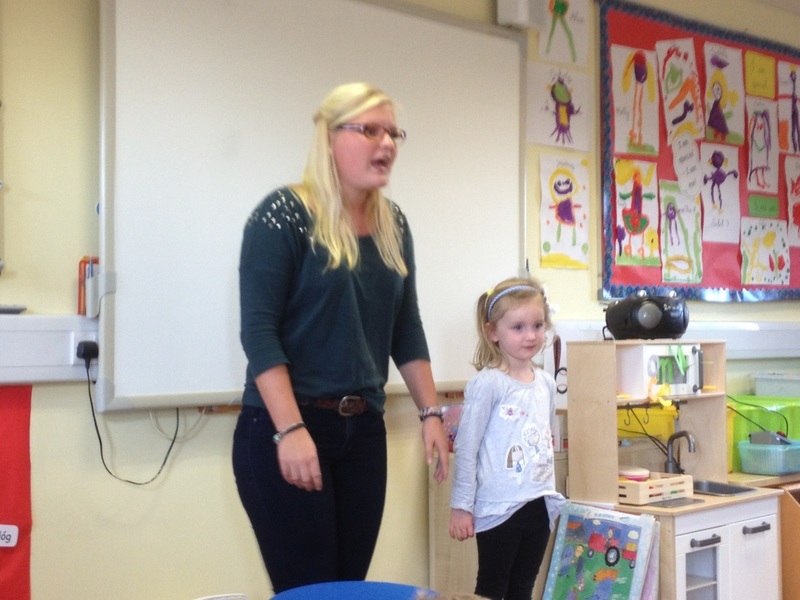 On Friday the 26th September we had lots of visitors in our class who came to share their European languages with us. We gave them a treat at the end by sharing some Irish songs with them. Thank you to all our fantastic visitors. 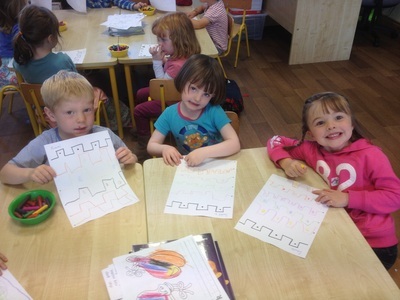 We really enjoyed having them in our class. Kate sang a song about a little cat to us in Polish. 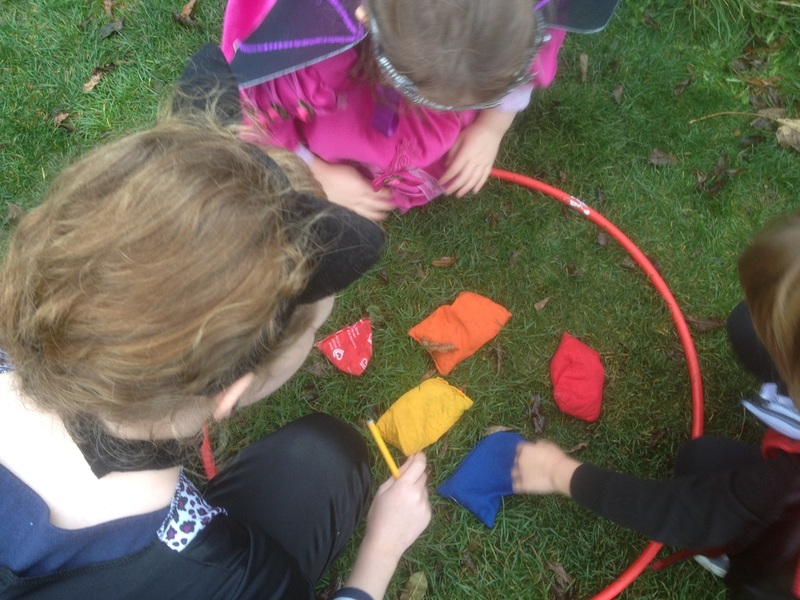 We had great fun doing the actions. We learned how to say cat and kitten in Polish. Lilleah's daddy Ludas is from Lithuania and he came to read us a story in Lithuanian. His book was all about animals and he is a super reader!!!. His book had English on one side and Lithuanian on the other side. 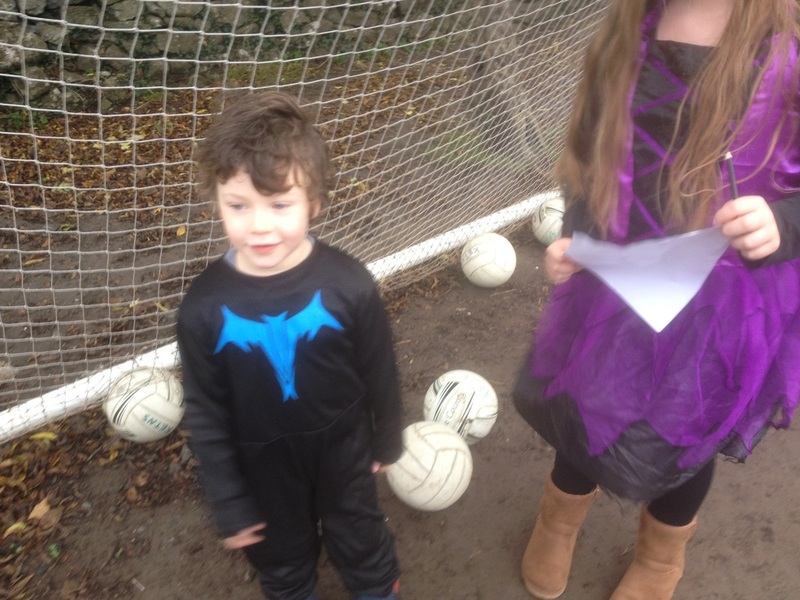 Well done to Lilleadh for helping out. 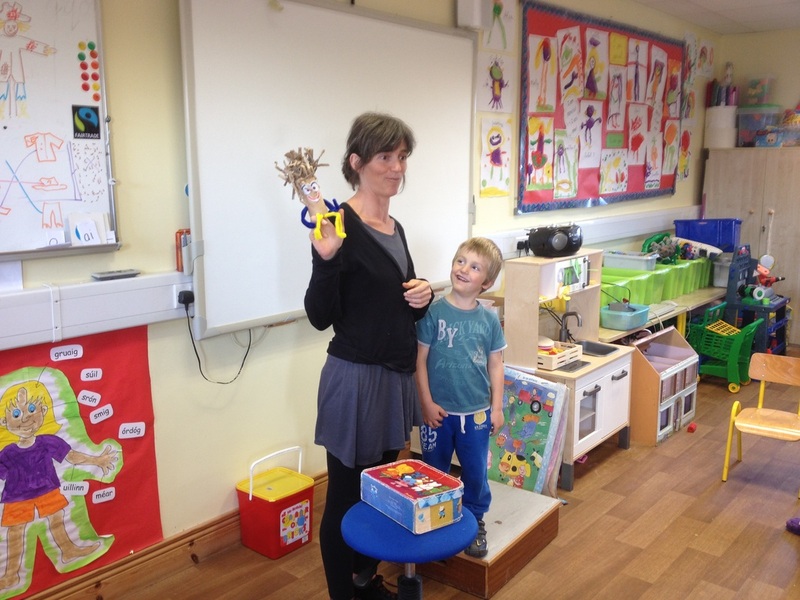 Elena and Daniel brought a cute puppet which Elena had made from a toilet roll insert. Her puppet had his own hairbrush and toothbrush. Elena is from Madrid and she sang in Spanish. Daniel helped out with the actions. 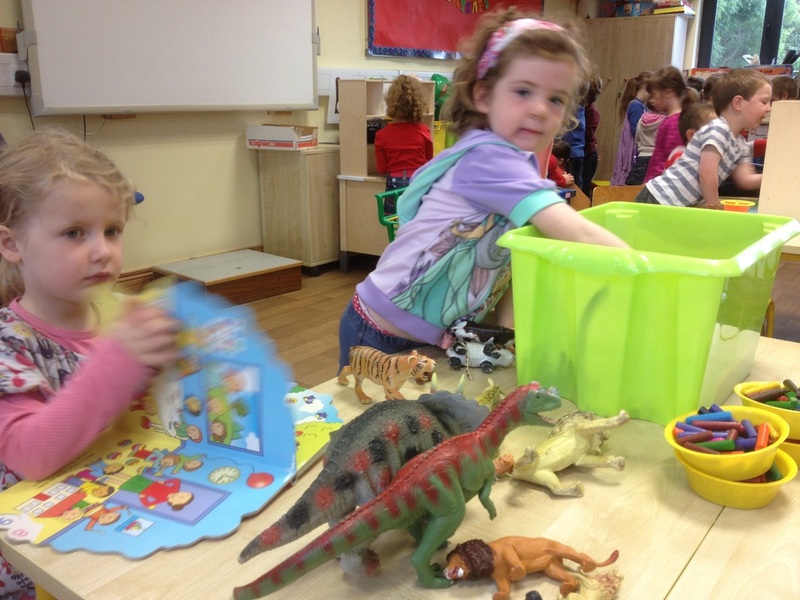 Elena says she will help us to make puppets later in the year. Mael's mammy Karima sang a song in French called Jean Petit Qui Danse. We all joined in and Mael did a great job playing the tambourine. Helen, Alex's mammy is from Wales. She told us lots of things about Wales in her Welsh language. She even pronounced the name of the town with the longest name in the world!. 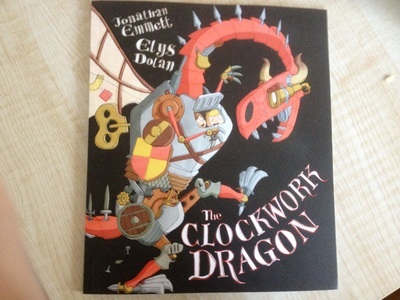 Llanfairpwllgwyngyllgogerychwyrndrobwyll-llantysiliogogogoch!!!!! What a mouthful!. Isla's minder, Sveya is from Germany and she sang two songs in German for us. We knew one of them, Heads, Shoulders, Knees and Toes in English and Irish already so it was interesting to hear it in German too. The other song was about a duck. We've been playing percussion instruments during music time. 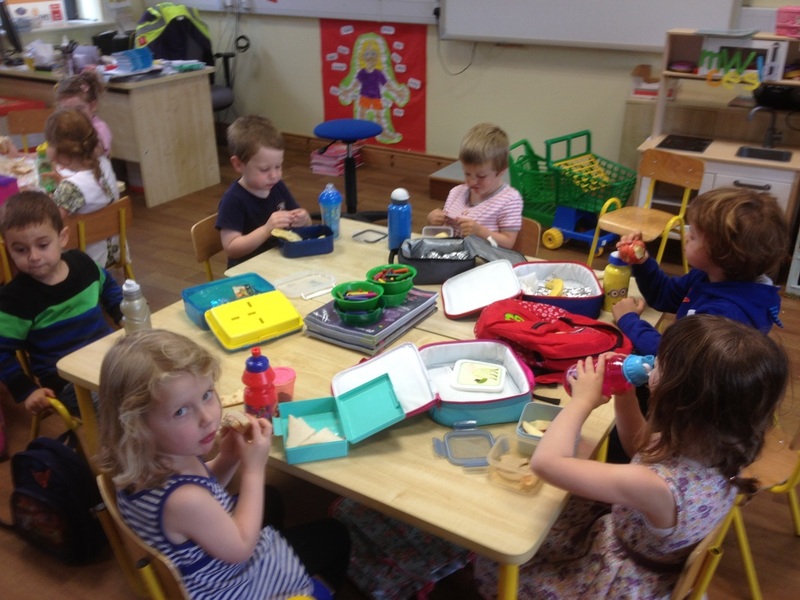 Our percussion box has shakers, tambourines, bells, castanets and lots more. We're really good at keeping a beat. 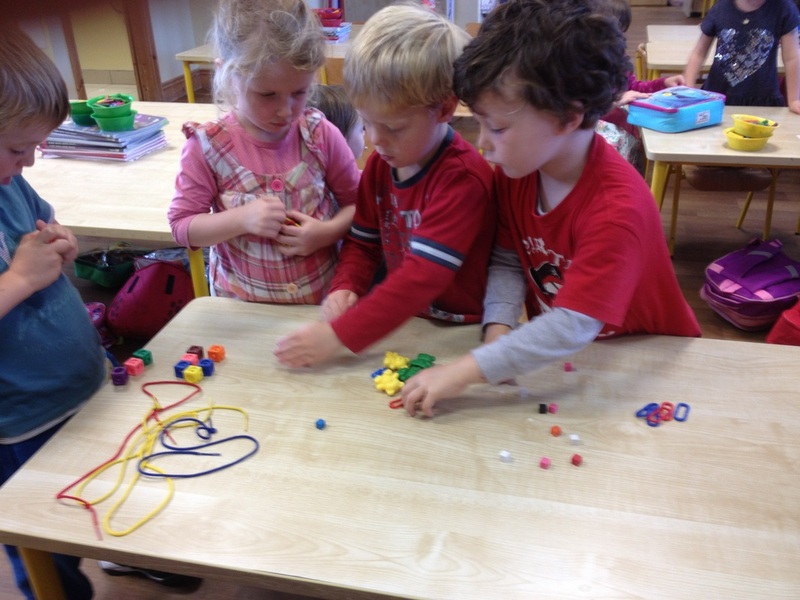 We're busy getting to know each other in Junior Infants. Playtime is a great time to make new friends and mix with the others in our group. We're learning lots about our new friends from our 'All About Me Boxes'. We put in some of our favourite things and some things that are special to us. We open two or three boxes each day and discover what treasures our friends have chosen. Lilleadh put Teddy the Bear in her 'All About Me Box'. Fionnuala loves bears and wanted to bring Teddy the Bear home with her!. Seán included his candles from his 2nd and 3rd birthdays and his magnifying glass. Jasmine showed us her panda mask. Isla and Ruairí were very excited to share their boxes with us. We now know that Ruairí loves orca whales. Marietta had her Mayo jersey in her 'All About Me Box'. Fionnuala knows that Marietta really likes her jersey but she thinks that Marietta's daddy, David may have sneaked the jersey in!!! Up the Kingdom! Break time is another good time to get to know our new friends. At lunch time we eat our yummy, healthy lunches but it's also a time to chat to our friends. 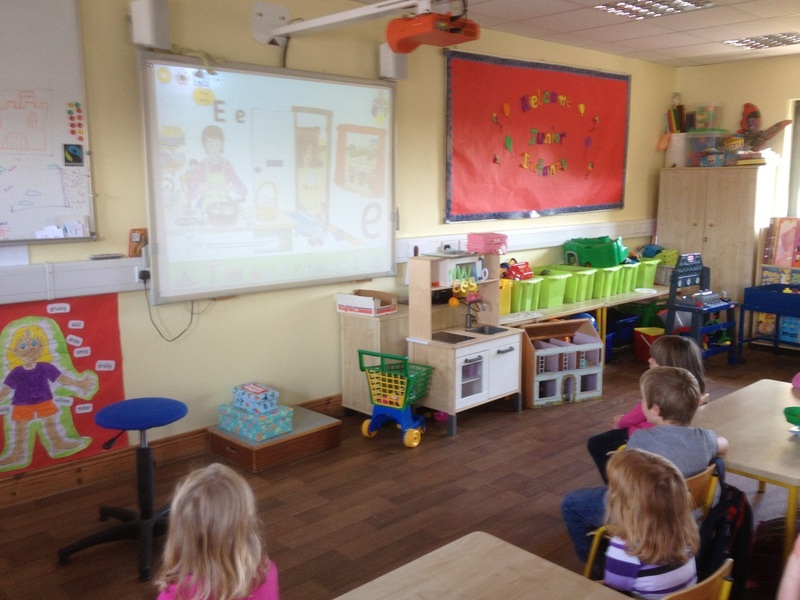 We're learning lots of new sounds from our Jolly Phonics programme on our interactive whiteboard. We're super at writing patterns. First we did a slide up, slide down pattern like crocodiles teeth and then we did a straight line pattern which looked like the top of a castle. Some of us drew castles on the back of our writing pages. 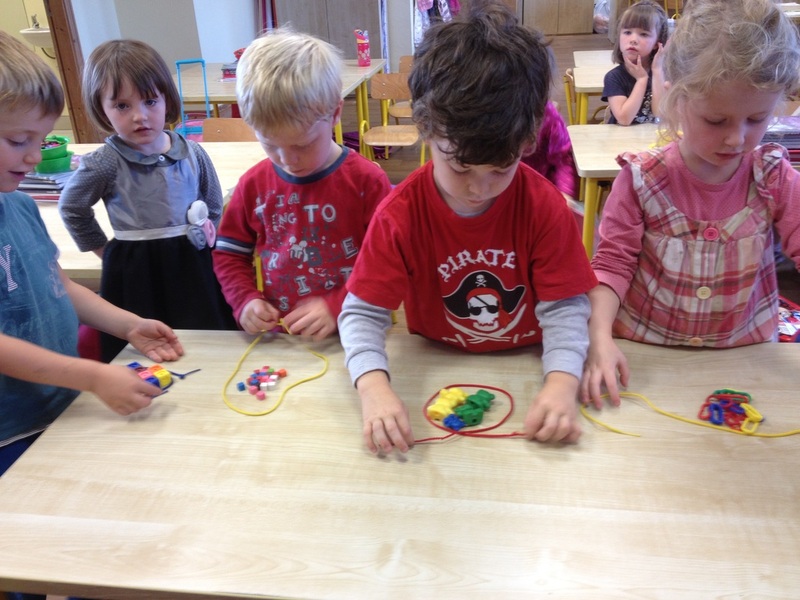 Matchsticks are really good for making patterns too. We've been working with lots of cards and puzzles. We matched cards which were the same, things that go together and opposites. We've been working on construction too. Look at the amazing buildings and towers we've been building. We're also very artistic in Junior Infants, so we took some time out to paint self portraits because 'I am special, so are you! '.